A golf glove like no other ! Golf Swing Bling – A golf glove as unique as the golfer who wears it. GSB is designed as a unique one of kind golf accessory. GSB is not just another golf glove. Each glove is embellished with hand sewn ornamental beading. Specially designed for your unique look. For the exclusive golfer. When you order your new glove, GSB comes to you in an elegant matching pouch to preserve and protect your custom glove. Stand out on the links this season with Golf Swing Bling! 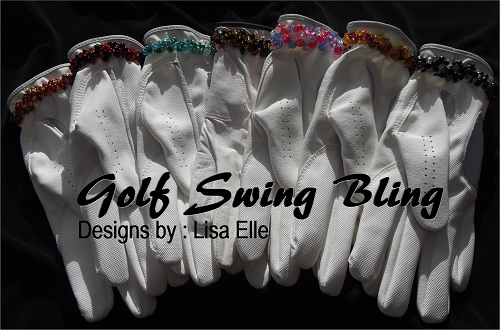 Contact me today to order your GSB golf glove at lisalgolfpro@gmail.com or by phone 506-232-0728. Available in a variety of colors. Cost is only $20.00 plus shipping for your exclusive GSB golf glove. Don't limit yourself to one, purchase a matching glove for each of your golf outfits. Add some BLING to your golf swing! these are just a few of the colours available for your custom look. Order yours today! Look great this season, one of a kind GSB golf glove. For the Diva in all of us! GSB is designed as a unique one of kind golf accessory. GSB is not just another golf glove. Each glove is embellished with hand sewn ornamental beading. GSB comes to you in an elegant matching pouch to preserve and protect your custom glove.